Greetings, my friends in music! Well, there was some big excitement over the winter here at River Music. On Monday Feb. 6th, my 13 year old son and I set out on a glorious adventure. We drove 5 hours to Boston from our home on the coast of Maine, and from there we flew to LA, which is about as far from Maine, in every sense, as you can possibly go . We were on our way to attend the Grammy Awards Ceremony, because I had been nominated to receive one a few months before. I was nominated as part of the Paul Winter Consort for our recent CD, “Silver Solstice”, which was one of the finalists for the “Best New Age Album” category. “Silver Solstice” is a collection of recordings made during our Winter Solstice concerts in New York over the last several years. As a member of the band, I played on most of the songs, and was lucky enough to be featured in a solo performance of my own song, “The Rising Moon”. I found out about the nomination during a winter concert I was leading at the Brooklin School. As you may have read in my previous newsletter, I’ve been teaching music four days a week at the local public elementary school. Last December we were putting on our annual Winter Concert. All fifty kids (the entire student population) were festooned in red satin and huge neckties and belting out Frosty the Snowman for all they were worth. At one point between songs, the Principal stood up to make a few remarks and announced that “Mr. Sullivan doesn’t even know this yet, but he has just been nominated for a Grammy Award” It was an unusual way to learn about such a remarkable development in my life, and amid the thunderous applause that followed I found myself as bewildered as I was happy. I suppose “”stunned” is the word. Nevertheless, I took a bow and pulled myself together. Then I kicked off a punchy tempo for “”Holly Jolly Christmas”, and got back to work. In a town of 500 souls, word spreads fast. And in fact, half of the townspeople were already there at the concert, so the word didn’t actually have very far to go. By the next morning, my fame and celebrity had fanned out like a forest fire across the Greater Brooklin area. The General Store was completely engulfed and the flames licked out even to the ships at sea, where the lobstermen passed the news on their radios. By sunset my back was raw from continual slapping and my right wrist ached from all the hearty shaking. A couple of days later I was attending the weekly meeting of the Brooklin Oddfellows Society, of which I am a proud member. I’m an odd fellow among Oddfellows there. Many of the other men are huge burly fishermen in flannel shirts, with weather-beaten faces and beards without mustaches. Some carry long knives on their belts and look as though they could scrape barnacles with their bare hands. In a quiet moment during the secret proceedings of the meeting, one of the men stood up and asked the record to show that “As far as I’m concerned, this is probably one of the only Lodges in the State of Maine that’s got a Grammy Award nominee for a piano player, and I think we ought to be damned proud of that!” Whereupon the usually reserved band of brothers erupted into a unanimous, sustained standing ovation, beaming at me with wide grins in various stages of disrepair. I was touched to the core, and I told them so. On the last day of school before I headed West to seek my fortune, I had a music class during the last period of the day. From the beginning of it, I sensed that something was afoot, though I was too dense to figure it out. There were odd glances among the kids, and unexpected comings and goings by teachers. At one point I tried to go and get something from my office down the hall, only to find the classroom door physically blocked by 5 or 6 hysterical kids who yelled “No! No! you can’t go out there” as the rest of them pleaded, “We all want to sing some more-right now”. With that ham-fisted lie, it was clear that something was definitely up, but I didn’t discover it until the bell rang. When it did, the kids all fled, as usual. As I turned off the lights and left the quiet classroom, I stepped out into what had what once had been the school hallway. Only now it had been transformed into the “Star’s Entrance” to the Grammy Celebrations. The tile floor was now a glamorous red carpet, made of red construction paper rolled out from the art room. Everyone in the school, the 56 students, teachers, support staff and parents, lined the walls on both side. When I stepped into the hall, they all broke out into wild cheering and applause and singing. They told me to walk the red carpet like a star and as I did, several of the kids pretended they were paparazzi and journalists, and pressed toward me with imaginary cameras and reporters’ note pads. It was a scene of wild excitement and joy, and after I had walked the gauntlet of “hi-fives” from the big kids and shy little ”Congratulations Mr. Sullivan” from the little kids, I stopped and gave a brief “press conference”. I told them that nothing that happened in LA could ever surpass the beauty of seeing all their bright faces so happy and excited for me. And I was right. I knew Brad was a very successful musician, but I had no idea he was this successful. We double checked the address and started looking for a doorbell to ring when suddenly the gate started opening majestically on its own. It parted, and we started slowly up the drive. It felt as though we were going to see the Wizard of Oz. The driveway was lined with beautiful shrubs and flowers and orange trees laden with fruit. Then the house hove into view. A gorgeous modern mansion, with terraces and balconies and windows everywhere, all aglow in the Pacific sunset. Inside we could see soft lamps and artwork and flowers. In front of the house was a quiet, glimmering swimming pool which overlooked miles of twinkling lights below and shadowy mountains in the distance. After a wonderful reunion and a delicious meal in a room that looked like an exquisite little Mexican restaurant, we made our plans for the next day. I had to check in at the Grammy office, but otherwise it was a free day. Brad said he had to be at a recording session, but we were welcome to join him if we were interested. The next morning we drove with him to the Twentieth Century Fox Studios lot. We strolled around the campus and saw several blocks of New York City circa 1965 over there, and over here was a tidy suburban neighborhood, with white colonial houses and picket fences. Close behind us was an ornate stucco Italian villa, with mosaic tiles and a huge bubbling fountain in front of it. Everywhere there were perfect lawns, topiary trees shaped like animals and fairy tale characters, and busy people whisking around on golf carts with the names of various shows and movies on them instead of license plates. We were almost run over by the Simpsons. The recording studio was in a plain looking building. By this time I was half expecting it to be in the shape of a giant microphone or a guitar. As we approached, a friendly man in casual clothes smiled broadly and opened the door for us. He exchanged a few friendly words with Brad and we continued on down the hallway toward the studio. “A friendly doorman?” I asked Brad. “No, the director of the movie we’re about to work on”, he answered patiently. Passing through a few more doors, we entered the control room of the studio. It looked like Mission Control in Houston. It was a large room, filled with three long, crescent work tables. Each table was filled with individual work spaces. Swivel chairs, computers, headsets, notepads, coffee cups and cell phones were everywhere. The first table was the domain of the actual recording engineer. He presided over an enormous array of buttons, knobs, sliders, computer screens and assistants who scurried around pushing and turning and adjusting everything. All the seats in the room were on one side of the tables, and all of them faced the enormous glass wall that formed one side of the room. On the other side of the glass was a large hall in which a 96 piece orchestra was warming up. In addition to the musicians, there were teams of people sitting at desks in the orchestra room as well, orchestrators and copyists and assistants. All there just in case there might be any question at all about what the correct note for the second oboe in measure 49 might be. Along another wall in the orchestra room was an elegant and elaborate buffet table for all the players. It was easy to see that they were all real musicians because most of them were hanging around at the food tables. In a few minutes the work began. We went back into the control room and found seats. The next thing we knew the conductor gave a cue and the orchestra roared to life. It would have been thrilling enough just to listen to such a massive, wonderful sound. But it was twice as exciting because we could watch the movie on large screens in the control room and listen as the soundtrack met the visual track for the first time. The movie was Ice Age Two, an animated movie set in prehistoric times. So when the orchestra made a dramatic,sudden swoop downward, I’d look up just in time to see a huge boulder tumbling off a cliff and landing in the valley below with a mighty thud supplied by the bass drum and tympani in the other room. It was like a modern day silent film with live accompaniment. and what made it particularly exciting was the fact that we were witnessing the marriage of the video and audio. No one had ever seen the two together yet. The composer certainly had a good idea of how it would sound, but even he had to imagine how his mock-up would actually sound when played by an enormous real orchestra. And my friend Brad, who had written all the orchestra parts, now got to hear exactly how that bassoon line would fit with the snake wriggling across the screen. It was exhilarating and hair-raising for everyone involved. And beneath the quiet, convivial murmur was a palpable electric charge as all these men and women, masters of their professions, tried to guide this enormously complicated and unwieldy project involving hundreds of people and millions of dollars, to a safe and successful birth. And though I haven’t seen it yet, I’ve heard they pulled it off beautifully. 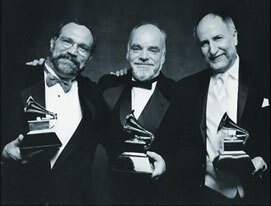 The Grammy ceremonies themselves took place on the following day. There were two other members of the Paul Winter band, cellist Eugene Friesen and bassist Eliot Wadopian, who had come to LA as well. And coincidentally, they had each brought one of their teenage children with them . We all agreed to meet in Eliot’s hotel room, which was just up the street from the Convention Center where the ceremonies were to be held. We met just after lunch, got into our tuxedoes, combed what little hair we had left, and headed over to the Grammys. Along with our stylish and handsome kids, we made quite a glamorous parade down Figuera St. in the hot afternoon sun. You might wonder why we arrived so early in the day. Most people are unaware that there are actually two Grammy ceremonies. One is in the afternoon and is not televised. The second is the one you see on television.. There are just over one hundred Grammys given out per year, and more than 90 of them are awarded during the first ceremony, which is for the musicians only. It also features a house band, performances, celebrity presenters and acceptance speeches, and in a way it’s even a bit more intense because it’s for “insiders” only. All six of us took our seats in a row not far from the stage. We sat in a “father-child, father-child” sequence. I sat back and enjoyed the proceedings, happily watching others win their Grammys and drinking in the constant parade of exotic looking characters and the wide variety of fashion statements being made. For each award presentation, they flash a list of the names of all the nominees for that award on a huge video screen above the stage. When our category was finally called, I was excited because I knew most of the other nominees and was eager to find out who would win. I thought about how happy I would be for the winner, and how much fun it would be to congratulate him at the party afterwards. I wasn’t the slightest bit nervous, because it didn’t occur to me for a moment that we would actually win. It was almost as if we weren’t even nominees. I had insulated myself from disappointment to such a degree that I had forgotten that we were actually a part of the contest. What I thought I was doing in LA in a tuxedo, I don’t know. But I do remember sitting there with an imbecile grin on my face, waiting to see what was going to happen. It wasn’t until the presenter got to the part about “And the Grammy Award goes to…” that things got serious. Suddenly I felt a big strong hand reach out for mine, and I realized that we three musicians had all instinctively reached out for support at the critical moment. Our kids, between us, held our arms. The presenter called our name, and I went numb. I snapped my head, mouth agape, toward my son. He snapped his head, mouth agape, toward me. It wasn’t a look of joy and triumph, exactly. It was more like we had just been in a car crash. I was in the aisle seat and by this point the other two guys were pushing toward the aisle for our walk up to the stage. I stumbled to my feet and found myself staring into the bosom of a marvelous supermodel. Supermodels constitute most of the workforce in LA, as far as I could discern. They serve the hamburgers, drive the shuttle busses, and serve as Spirit Guides to the sacred mountain of the Grammys. Our lovely guide flashed a perfect smile at us and invited us to follow her. She led us up onto the stage, where we were met by another supermodel who handed us each our Grammy trophies–golden Victrolas on heavy black pedestals that felt like marble. The plates were not engraved. They were all blank. We gathered rather sheepishly around the microphone, where we were expected to make our acceptance speeches. Eugene spoke first, and thankfully he had enough composure to be at least generally coherent. He thanked Paul Winter, who was, after all, the reason we were there in the first place. And he also had the grace to thank many of the other people who had made the project a success, such as the recording engineers and the other musicians who had played on the CD. Then he yielded the mike to me. Now, being a purebred Irishman, I am seldom at a loss for words. In fact, shutting it off is far more of a problem than getting started. But at that moment I was absolutely tongue-tied. After babbling for a few seconds about how surprised I was, I offered a big hello to all my friends back in Brooklin Maine, completely forgetting that we were not on TV. When I finally realized that none of my friends back in Brooklin Maine would ever get my greeting, I set my sights a little lower and instead started waving to Henry out in the audience, though I learned later that he was no longer out there, so in fact I was waving to no one. At this point I realized I had bottomed out and handed the mike to my friend Eliot, who made a better go of it than I had, although he too, was a long way from delivering the Gettysburg address. When this triumphant episode was over, I was eager to head back to my seat and recover in the dark anonymity of the theater. But no. We were headed off by another supermodel and told to follow her backstage. Our first encounter was with the President of the Grammy organization, who smiled warmly and congratulated us. We were then led to another area for more instructions. I decided to go get our kids so we wouldn’t become separated. I slipped through a side curtain and back out into the audience. Groping awkwardly up the aisle, and squinting in the darkness, I began wondering why the kids didn’t seem to be where we had left them. The winners in the next category were already onstage delivering their speeches, so I hunched over as I walked, as though that would somehow make me invisible. Sensing a presence, I turned around and once again encountered the smiling radiance of our supermodel guide, who had been dispatched to get me out of there. “Please follow me, Mr. Sullivan,” she whispered firmly through her clenched smile. “But the kids…” I stammered weakly. She told me they were already waiting for me backstage, and led me quickly through another curtain. Reunited with the kids, we entered into a rapid succession of media interviews. As we jogged along behind our guide we were briefed on each next appointment: “Now you’ll be going to room C, where you’ll do a three and a half minute interview for Satellite Radio”. After that, it was room D for print journalists, E for Foreign media, F for US photographers. When we’d enter a photography room there was a blinding blizzard of flash bulbs and shouted directions. “Turn slightly to your left, please” “Look directly at me, please”.”Over here!”, “Hold your statue up higher please”! I felt like I was Marilyn Monroe. Finally we were through. We were exhausted and hungry. I asked our guide if we could have a bite to eat. “Oh no”, she gasped, “We need to get you into your seats for the television broadcast. Follow me”, she said, and hurried off to another building. Then things really got overwhelming. We found ourselves backstage in the 15,000 seat Staples Center, a huge arena where the Lakers play and where mammoth shows take place. Like the Grammys. , the next one was Madonna, then Gwen Stefani and Sting and Stevie Wonder and Bruce Springsteen and Paul McCartney, and…well, you get the picture. These were the dressing rooms, and they stretched out for what seemed like a quarter of a mile. This was the inner sanctum, the backstage lounge and dressing rooms of many of the biggest music stars on the planet. It was really the first time I had calmed down enough to understand what was happening to us. I exchanged a friendly nod with James Taylor and realized I wasn’t in Maine anymore. We were ushered into our seats. We were positioned near the stage on the left hand side of the hall, about 10 rows up. This gave us a prime view, not only of the stage itself, but also of the seats right in front of the stage, where all the biggest stars and their entourages sit. As the evening progressed, I kept a list of all the famous people we spied. I didn’t know half of them, but luckily our teenage children knew them all.”There’s Little Kim!” they’d squeal. “There’s Dr. Ice Kool!” I dutifully wrote them all down. It was like a bird-watching expedition. By the end, I had collected about 60 specimens. The show itself was thrilling and spectacular, and although I didn’t have much purely musical interest in most of the pop superstars, their mastery of the art of showbiz was unassailable. They absolutely owned that stage, as well as all the 15,000 people watching them. And remember, these were 15,000 insiders, many of whom had themselves entertained 15,000 people. But these performers were not intimidated in the least. One after another they got out on that stage and just mowed us all down with their intensity. I didn’t end up liking the music any better, but I sure gained a lot of respect for what a pop star can do. After the concert, several hundred of us went back to the adjacent Civic Center for the Official Grammy Party. It, too, was intense. We entered the enormous ballroom and were transported to a sort of fairy land. The light was autumnal–reds and dark orange. There was a slight mist in the air, which gave it an enchanted feel. There were buffet tables and bars everywhere, interspersed among the couches and chairs and raised platforms with fountains and more seating areas. A large shelf, about ten feet wide, ran around the entire edge of the hall, about twenty feet up. On this shelf were at least 50 trees; mature trees that looked to be about the size of an apple tree. They were evenly spaced around the ballroom. I glanced up at them as we entered and saw that they had autumn leaves on them, glowing in the reddish light. I didn’t have much time to consider the trees. The activities on the floor were completely absorbing. Along a distant wall was the music stage. As we entered the room, we heard a current hit from country radio. That was followed by another one, and a few minutes later a hit rock song. It was like having a DJ playing a top-40 countdown set. The only difference was that this was all live, and all performed by the original artists. After a while, I happened to glance up at the trees again, and I almost dropped my champagne glass. The trees had shed all their leaves, and instead were now covered with snow, piled up about an inch high on every single branch and twig. The light in the hall had changed imperceptibly to a soft wintery white. There was no one up on the ledge, just 50 trees which had become covered with snow as the party raged on below. And when I looked up later, the trees had tiny green spring leaves on all their branches. Not a drop of snow was to be seen. Nor had anyone drawn our attention to any of this. It was as though the Grammy Association had recreated life itself just for our casual amusement. I was starting to feel like it was time to come home from L.A.
During all this time we were exchanging air molecules with some of the world’s biggest music stars, though we didn’t exchange much else. Even though the party was for all Grammy nominees and winners, there was still an invisible but rigid separation between the superstars and the rest of us. We got to nod and smile at them, but no e-mails were exchanged. There were some exciting encounters, though. My son had one, in fact. He had been dying to meet his favorite band, Green Day. And though they had performed onstage, we hadn’t had a chance to get close to them. At one point in the proceedings my son had gone off to the bathroom. He returned about a half hour later, visibly shaken. “Dad! Dad!” he panted, “There was a huge long line at the urinals and I was standing right in front of the lead singer of Green Day the whole time!” I guess we savor our moments of glory wherever we might find them. After a few hours we had had enough. The exhaustion, the jet-lag and the abundant food and drink had just about done us in. I didn’t even stay to watch summer come to the tree balcony. I’m sure there were fireflies! We gathered up our complimentary “goody bags” (hair care products for us three bald Grammy winners), and headed back to the hotel, past the 4 acre parking lot reserved exclusively for limos. Hundreds of them. Back in our rental car, my son entered in our destination to the GPS Lady and her reassuring voice said, “Freeway entrance on the left in .5 miles”. I breathed a sigh of relief. Our Spirit Guide back to the real world. The next morning we headed back to Boston and then took a bus back to Maine. When we arrived, the whole town gave us a hero’s welcome home.The lobstermen were back on their radios, congratulatory lines formed at the grocery store, and my mailbox was positively overflowing with so many cards and letters that I am still trying to answer them to this day. Has the Grammy changed my life? Yes, of course it has. It puts me into an elite group of musicians. It’s a powerful credential that saves a lot of resume space. It cuts a lot of ice. And yet in most ways my life hasn’t changed a bit. As Jerome T. Jerome once said, “Life tastes pretty much the same, whether you sip it from a crystal goblet or gulp it from a stone mug”. I’ve tried it both ways , and he’s right.